32 England internationals appeared in this shirt. Three players made nine appearances each; Kevin Keegan, Dave Watson and Ray Wilkins. Alvin Martin and Peter Withe both made their international debuts against Brazil in the last game in which the shirt was worn. Three players won their last cap wearing the shirt. Tony Currie won his seventeenth, Bob Latchford his twelfth and Gerry Francis captained England for the first time in the red shirt, on his twelfth and last international appearance. Kevin Keegan was top scorer in this shirt with five goals, and was also captain on six occasions. Stuart Pearson was second top scorer, with three of his five international goals scored in this shirt (including his last). 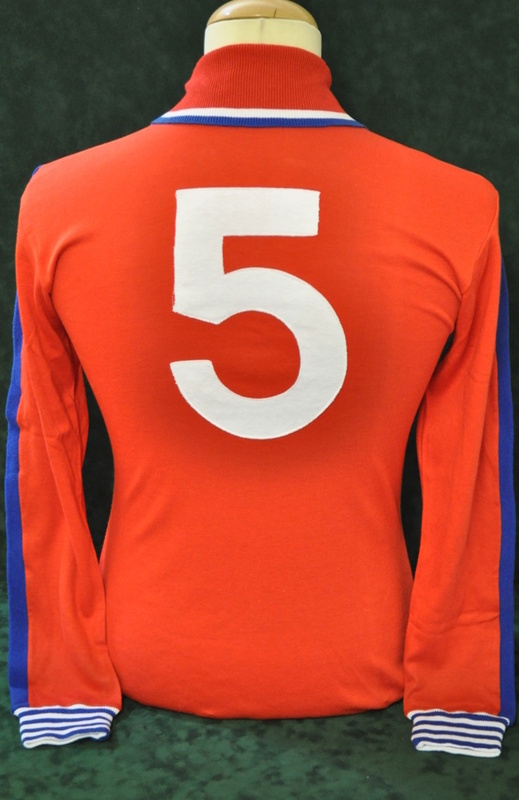 Peter Barnes also scored his last England goal in this shirt. 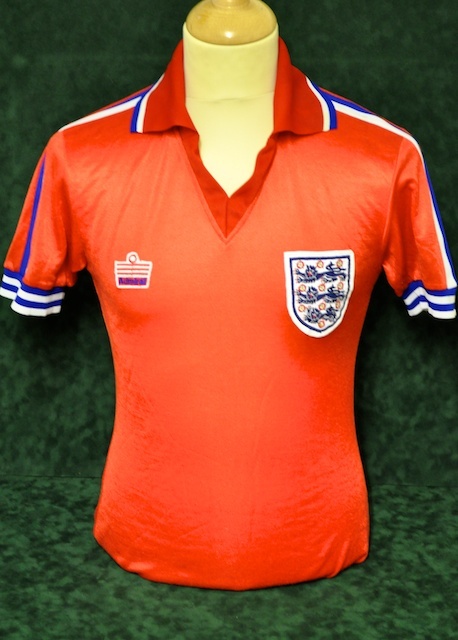 Ray Wilkins was the only player to score his first international goal in this shirt. 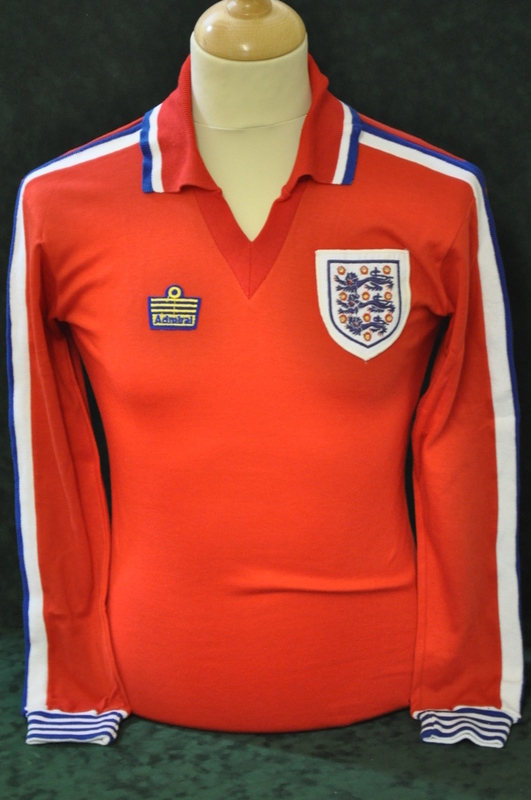 Captains Dave Watson captained England for the first time in this shirt and Emlyn Hughes was the only other player to lead out his country in the shirt, taking the honour twice. 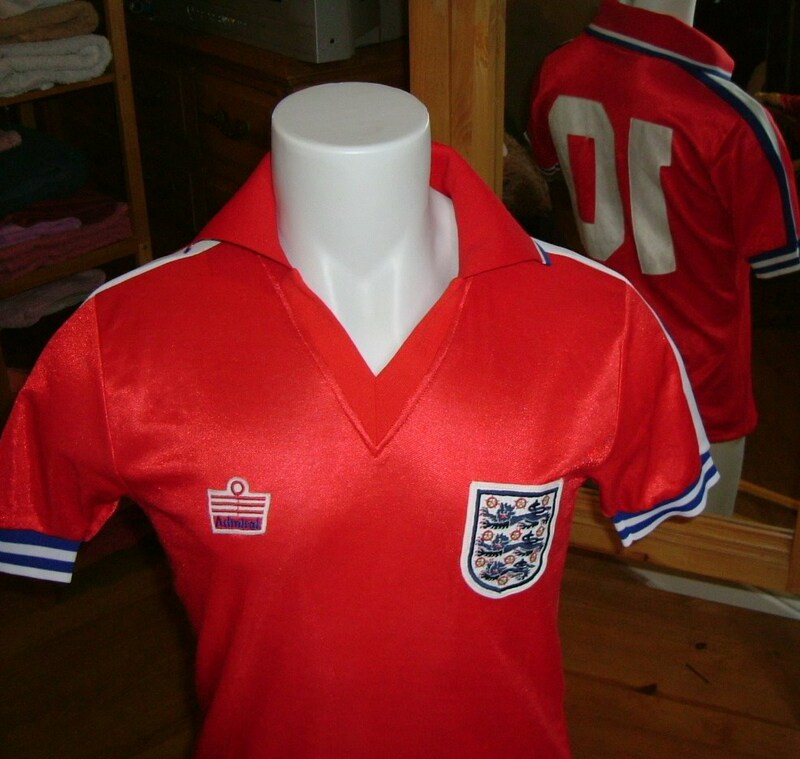 In a reverse to the 1974 home shirt, England wore red shirts with white shorts and red socks. Five of its first six appearances were against fellow World Cup winners, including for every game of the first unbeaten tour of South America, in 1977, as the three-year reign of Don Revie came to an end. Its impact was reduced in the second half, however, as six players changed into shirts with the old-style font! The Under-21 team wore a matching pair of red shorts, turning it into an all-red kit, against Switzerland on 18 November 1980 at Ipswich. Photos above are displayed with permission from Simon Shakeshaft, curator of the National Football Shirt Collection at England Match Shirts, which is part of the Neville Evans Collection. They are nice illustrations of the main changes that this shirt underwent during its five-year service. Both shirts were worn by Dave Watson. 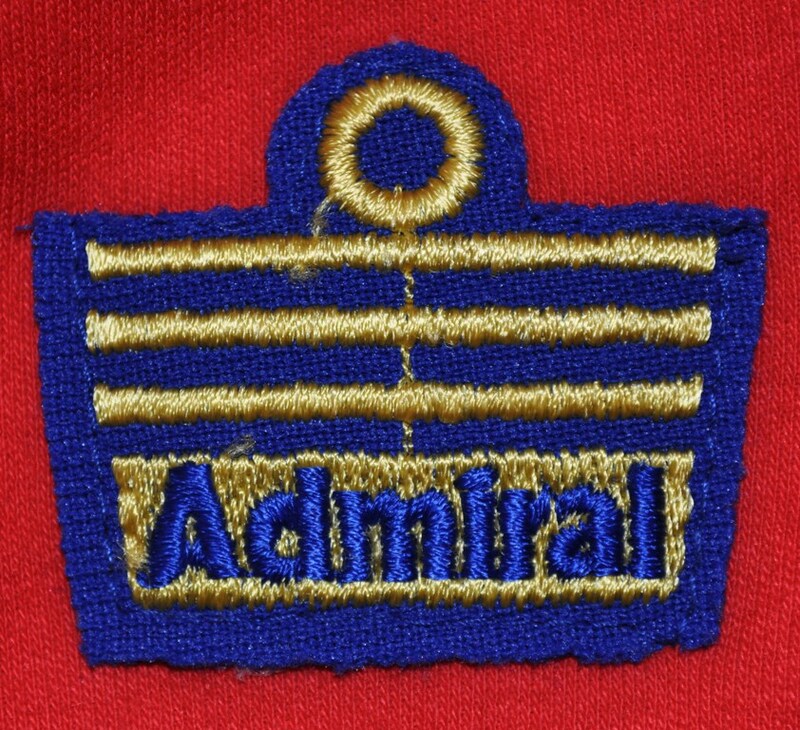 The first, above left, is a long-sleeved shirt with the original yellow and blue Admiral logo and the second, above left, worn against Romania in 1981, is a short-sleeved shirt with the updated red, white and blue Admiral logo. 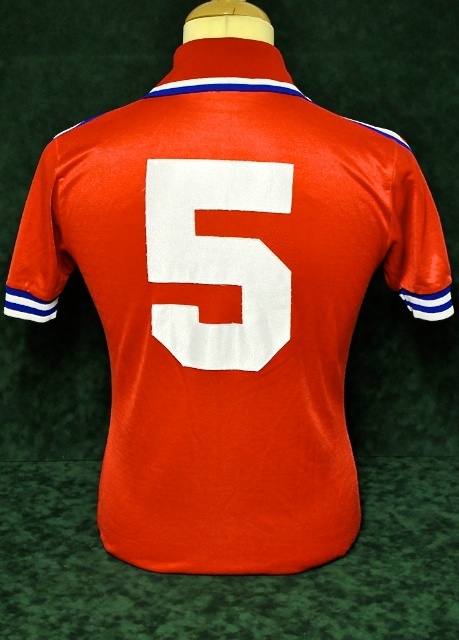 As both are number-five shirts, we also have excellent examples of the two different number fonts used on these shirts. Notes England wore the red away shirt with the white away shorts, but wore plain blue socks, against Brazil. Notes England wore the red away shirt with the white away shorts, but wore white socks--against Bulgaria. Notes England wore lightweight shirts--against Austria. Notes England wore the new style red, white and blue Admiral logo, which was worn on their new white shirt, introduced the previous year. The shorts, however, remained with the old style logo. 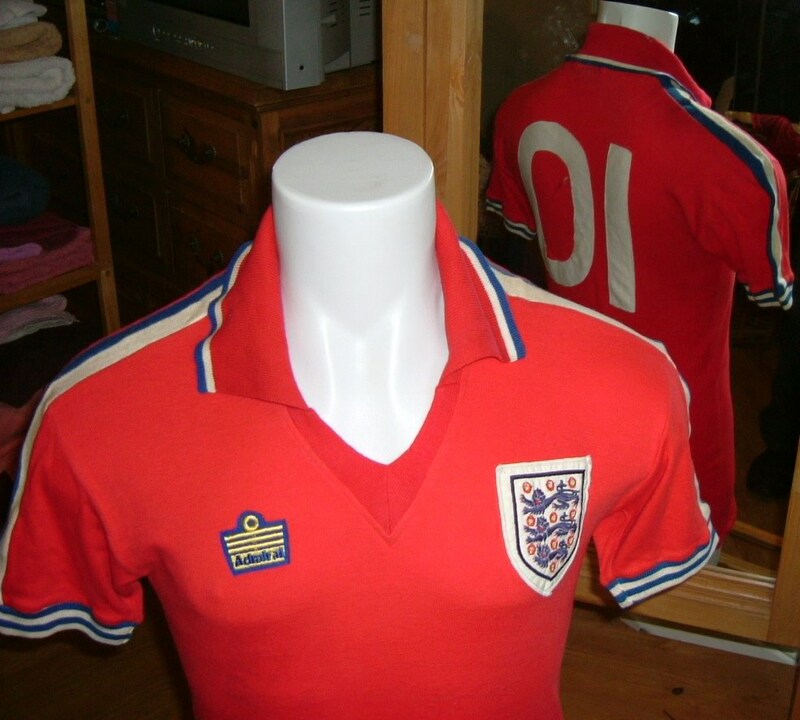 Two number-ten shirts from Richard Clarke's 'Three Lions - England Match Worn Shirts' Facebook Collection. These were worn by Bob Latchford in 1978 (left) and Graham Rix in 1981 (right) and are further examples of different logos, number fonts and shirt materials worn during this period.